Good morning polished world! How are you all doing on this fine Sunday? I thought I'd fit one more post in before September is done! I'm kind of overwhelmed again because here I am behind on posts, editing photos, and well everything. I have to get the monthly mani favs up tomorrow or the next day. I also need to update my Instagram, and should probably get around to updating Facebook again. SOOOO many things to do. Now that it's Fall though, I'm going to take some time to do it all. Hopefully. Also, guys....Halloween is almost here! Some months I dedicate all of October to Halloween, but I haven't even started planning. I blame work, I really need to not let it keep sucking up all my time. I can't blame work entirely, I've just become super lazy in my older age. Or maybe I've become boring.......hmmmmmm. Anyways, today's manicure! 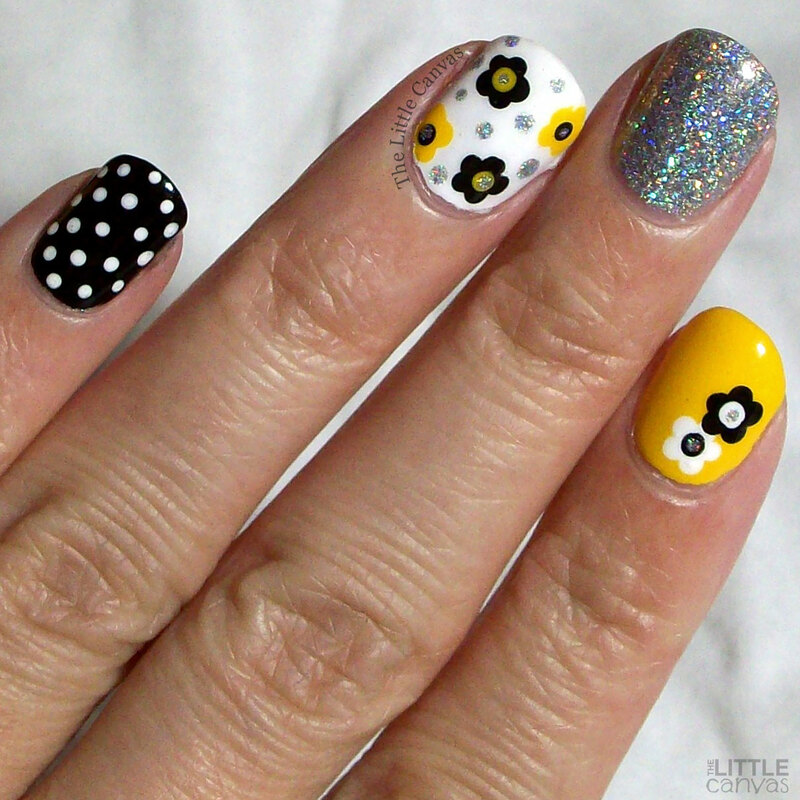 You know me and my floral manicures, and nothing is better than a simple dot flower design. I found something similar to this on Pinterest and had to re-create it. Have to love the yellow, black, and silver combo. Really, this is one of my favorite dot manicures that I've done. Cute, isn't it?? I'm not a huge fan of yellow polishes but this one is absolutely lovely. It's right up there with the yellow OPI I love so much. Probably the only two yellow polishes that look good on me. Bottomless Mimosas covers completely in two coats. 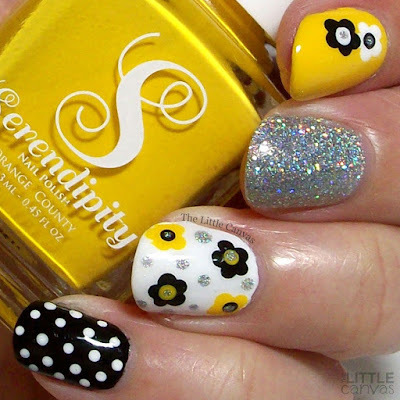 Most of my Serendipity Polish's are one coat, but it doesn't surprise me that a yellow takes two. I find that they always need two in order to build up properly. Who knows, maybe there's a one-coat yellow out there and I'm just missing it. I really love the index finger. I feel this accent nail really did tie the whole manicure together. I debated on keeping it plain, then debated on putting black polka dots on it. I'm so happy I went with the flowers. It's just so dang cute.